Helia Bravos Holis (1901 - 2001) was a 20th century botanist from Mexico who focused on the many cactus species found in her home country. 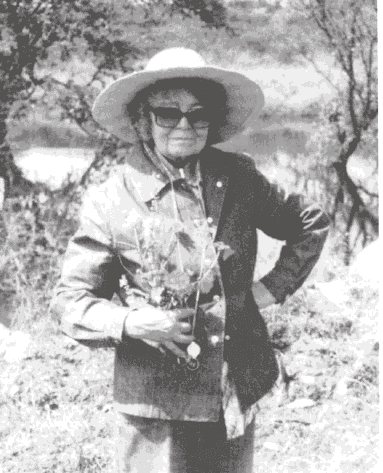 Helia Bravo Hollis (1901-2001) was a Mexican botanist and biologist who focused on the many cactus species found throughout Mexico. She grew up near Mexico City, surrounded by tall volcanoes and raised by parents who loved nature. Bravo Hollis, or “la maestra Bravo,” as she was known by her students and colleagues, earned a master’s degree from the National Autonomous University of Mexico (UNAM) in 1931 and later received an honorary doctorate. She published her first book in 1937, just one year before Ynes Mexia, another accomplished Mexican botanist, passed away. We can only imagine the incredible collaborations they might have undertaken if they had overlapped for longer. Bravo Hollis was one of the founders of the Mexican Cactus Society and assisted in the discovery of several Mexican cactus species. Two species, Ariocarpus bravoanus and Opuntia bravoana, were named in her honor. She published multiple books and more than 150 scientific papers, adding vast amounts of research to the body of knowledge on desert plants. Though she was one of few women involved in scientific research in the 1930’s, Bravo Hollis felt that she was always respected. “The men always treated me as a colleague and gave me my place [translated by G. Serrato Marks],” she told Como Ves, UNAM’s science magazine. Outside of her research, Bravo Hollis was passionate about conservation, so it is fitting that the Helia Bravo Hollis Botanical Garden in Puebla, Mexico is home to several endangered cactus species. Helia Bravo Hollis: La pasión por la ciencia de una mujer centenaria. Concepción Salcedo Meza. Universidad Nacional Autónoma de México. Helia Bravos-Hollis. Chuck Staples. Crop Science Society of America. Gabriela (Gabi) Serrato Marks is a paleoclimatologist and science writer. She is currently a rising fourth-year PhD student in marine geology at the Massachusetts Institute of Technology. Her main research focuses on past rainfall in northeast Mexico. Outside of the lab, she enjoys creating digital media content. You can check out her grad school adventures on Twitter and Instagram or on her website.